A man who ripped clumps of hair from a young woman’s head after he dragged her across a dance floor on Christmas Eve was given a four-month jail sentence yesterday. Ronald William White, a 50-year-old married father of two, of Castleroe Road, Coleraine, had previously pleaded guilty to offences of assault occasioning actual bodily harm and assault and disorderly behaviour relating to an incident at the Anchor Bar in Portstewart last Christmas. White punched another woman during the dance floor flare-up, the court heard. 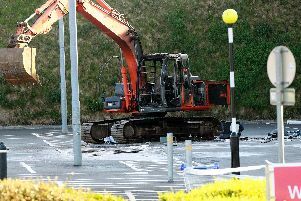 Coleraine Magistrates’ Court District Judge Peter King said the courts had to send out a strong message that such “gratuitous, humiliating and completely and utterly uncalled for” attacks could not be tolerated. A prosecutor said White had been walking across a dance floor when he spilled drink over one of the woman and he then put his forehead towards her and asked through gritted teeth: “What the f**k is your problem?” before launching assaults. One of the woman lost part of her hair after being pulled across the floor by White and was scratched in the face. She now suffers from post traumatic stress disorder and suffers panic attacks. When interviewed, White told police he had been out to a number of venues and couldn’t remember going upstairs in the Anchor Bar as he was drunk. He claimed he had not taken alcohol for two years as he “didn’t like hangovers”. After watching the incident on CCTV White had said he would like to meet the women and apologise to them, the prosecutor said. Defence barrister Alan Stewart said it was a “shameful incident” and his client, a lorry driver, said he was “completely gutted” by what he had done. The barrister said White could give no explanation for his actions after a friend asked him to go out, but because it was Christmas the defendant decided to drink and had lots of beer and spirits. Mr Stewart said White had brought shame on his family and had been off alcohol since the incident.